I love Nebraska. I’ve had the occasion to go there over a dozen times, mostly for an annual Vietnam veterans reunion. I’ve crisscrossed the state and met hundreds of wonderful people. They were friendly, kind, and most welcoming, which is something a person from New Jersey never expected. 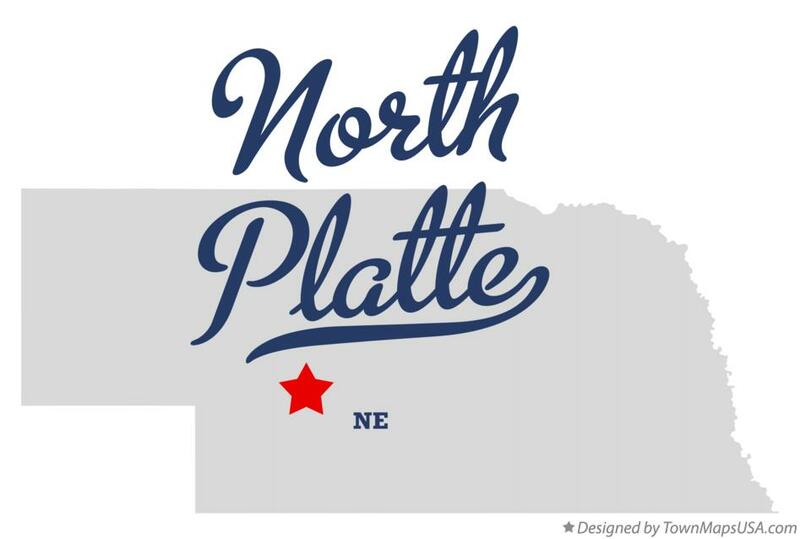 But I’m not writing about the whole state, I’m writing about one town in particular, one very special town; North Platte. I’ve been to North Platte at least a half dozen times, and I love the town. But a recent article in The Wall Street Journal reminded me about the specialness of North Platte, something I’d like to share with you. To tell this story, I have to go back in time, all the way back to World War II; but stay with me, because I’ll be bringing you right back to today at the end. First of all, a little geography. North Platte was a stopping/ watering lcation for the Union Pacific railroad, which ran smack through the town. Back in those days, steam locomotives had to stop periodically to take on water for their steam engines. North Platte was always a stop. The Union Pacific, founded in 1862, was the first transcontinental railroad, running from Council Bluffs Iowa, to the Pacific Ocean. On December 7, 1941, the Japanese bombed Pearl Harbor, and the United States was at war. Just ten days later, on December 17th, a train loaded with soldiers from the National Guard was on it’s way west. Thinking these were fellow Nebraskans, over 500 local people showed up to greet the train, bringing homemade cakes and pies and sandwiches for the troops. It turned out that the troops were not from Nebraska, but were National Guard troops from Kansas. The townspeople fed them anyway, and the whole story starts there. One woman from the town, Rae Wilson, thought it would be a good idea to meet all the trains. The next day she started working on the canteen. Volunteers poured in. Local merchants donated goods. By the day after Christmas, when the next train arrived, they were up and running. The North Platte Canteen was born. Before long, train after train filled with troops were passing through and the locals were greeting 1000 troops a day; but that was only the beginning. 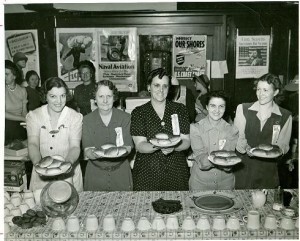 The word spread about the canteen, and donations and volunteers began to pour in. A coffee importer sent cans of coffee, churches sent turkeys and other food. Benefit dances and socials were held to raise money for the canteen. Volunteers from as far as two hundred miles away came in to serve food to the troops. Boy scout troops and other youth groups raised money. In all, people from over one hundred twenty five communities donated time and money to the canteen. It was a time of rationing. Items like coffee, sugar and gasoline were rationed. People gave up their spare ration stamps to send to the canteen. Farmers sent produce to the canteen rather than selling it. The women showed kindness in many different ways. They helped soldiers write letters home, they passed out fruit, and magazines, and decks of cards. Every day they baked birthday cakes. 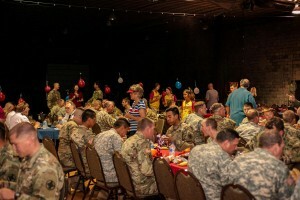 Any soldier having a birthday that day got a birthday cake. And the numbers kept growing as the war progressed. More and more trains arrived in North Platte, sometimes as many as 32 trains a day, from early morning until after midnight. Every train was met, every single train. In all over six million troops stopped at the North Platte Canteen and were met with Nebraskan hospitality. 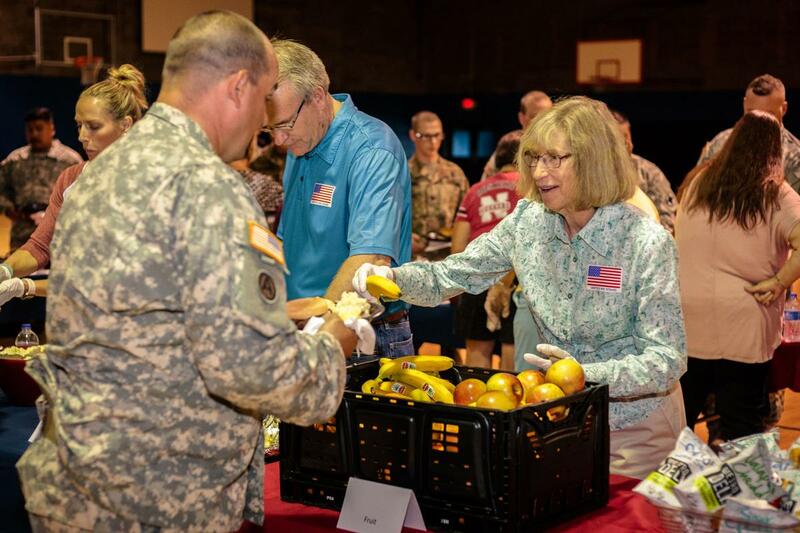 Over 55,000 volunteers from across Nebraska volunteered their time at the canteen. Watch this before reading on. We’re not done yet. The war ended in August 1945. 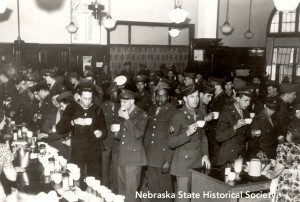 The canteen remained open, however, serving the trainloads of soldiers, sailor, and Marines who were now coming home. It finally closed it’s doors in April 1946. 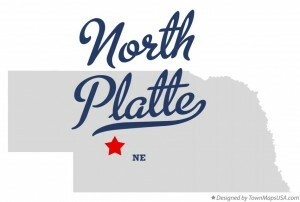 The building was demolished in 1973, so the North Platte Canteen is gone…. Now we come to today. This past June, less than two months ago. A National Guard unit from Arkansas completed it’s annual training in Wyoming. 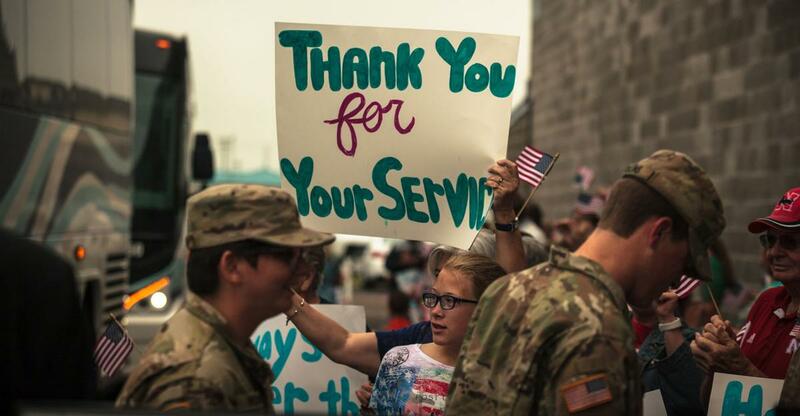 Over 700 National Guardsmen would be returning home, this time by bus; 21 buses in all. The bus company noted that North Platte was along the route, and contacted the local visitors bureau to see if they could handle that many troops, in and out, for a quick snack. They had no idea the response they would get. The word went out and literally hundreds of North Platte citizens showed up to volunteer. This time it was at the North Platte Events Center. The Canteen building was gone, but it was revived in spirit. The Arkansas troops were met with sandwiches, salads, and fruit, cakes, brownies and cookies. The mayor stood at the door and shook the hand of every soldier. The world may have changed, but North Platte had not. 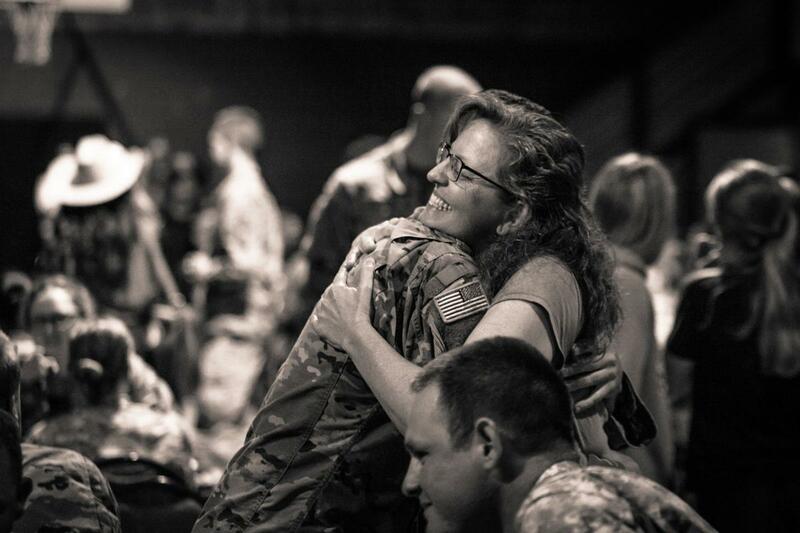 When service members pass through their town, it’s something they will never forget. That’s who these people are. This is the Heartland. This is America. Barbara McManus on Well Hello Mary Lee!